Arcanum’s Wade Meeks takes a jump shot in a Cross County Conference rivalry game against Franklin-Monroe on Friday. The Trojans won the game, 39-37. Arcanum’s Zach Smith goes up strong underneath the basket in a Cross County Conference rivalry game against Franklin-Monroe on Friday. The Trojans won the game, 39-37. 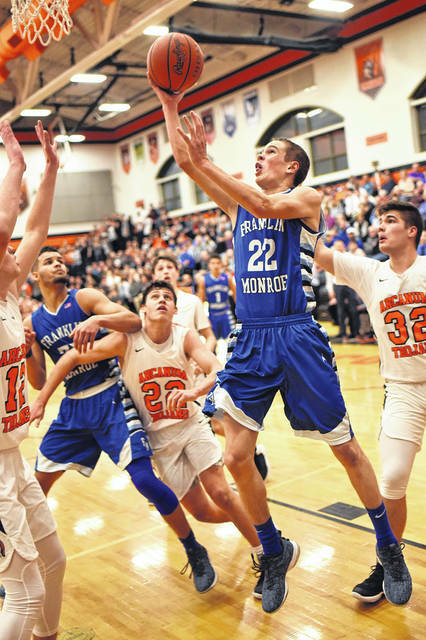 Franklin-Monroe’s Ethan Conley takes a jump shot from just inside the free throw line in a Cross County Conference rivalry game against Arcanum on Friday. The Trojans won the game, 39-37. 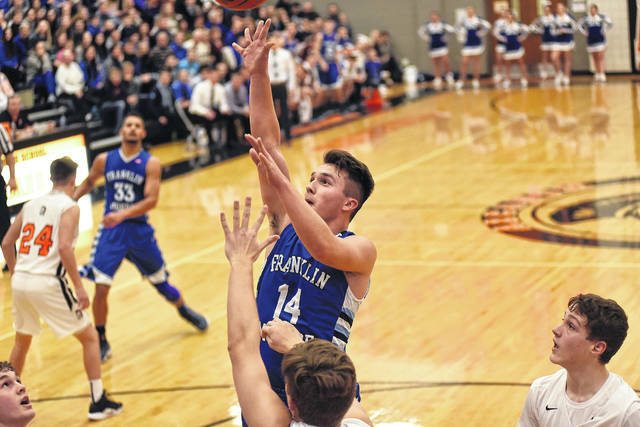 Franklin-Monroe’s Jackson Crist puts up a shot from underneath the basket in a Cross County Conference rivalry game against Arcanum on Friday. The Trojans won the game, 39-37. Arcanum’s Evan Atchley goes in for a layup in a Cross County Conference rivalry game against Franklin-Monroe on Friday. The Trojans won the game, 39-37. 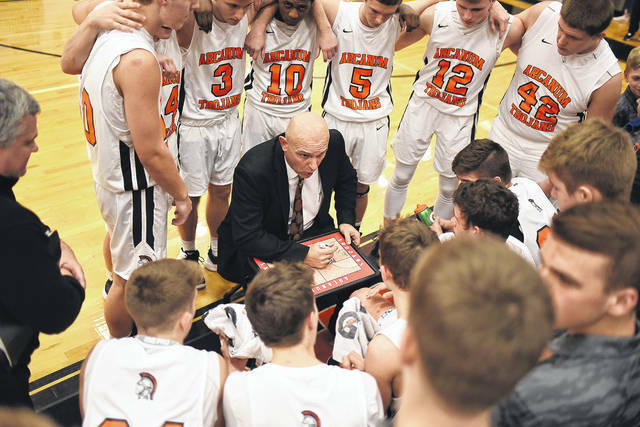 Arcanum coach Jim Melton talks to his players during a break in a Cross County Conference rivalry game against Franklin-Monroe on Friday. The Trojans won the game, 39-37. 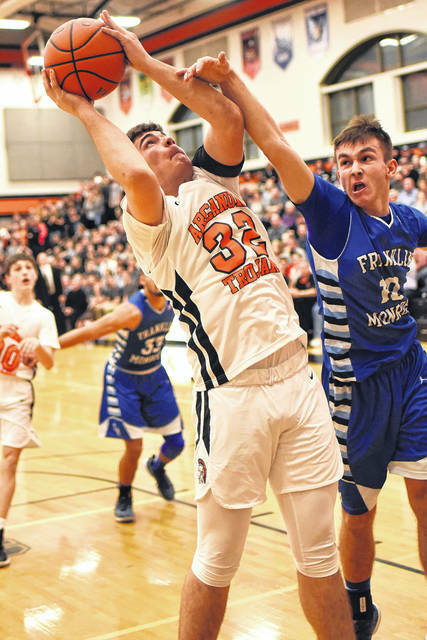 Franklin-Monroe’s Ky Cool tries to split a pair of Arcanum defenders as he goes to the basket in a Cross County Conference rivalry game on Friday. The Trojans won the game, 39-37. 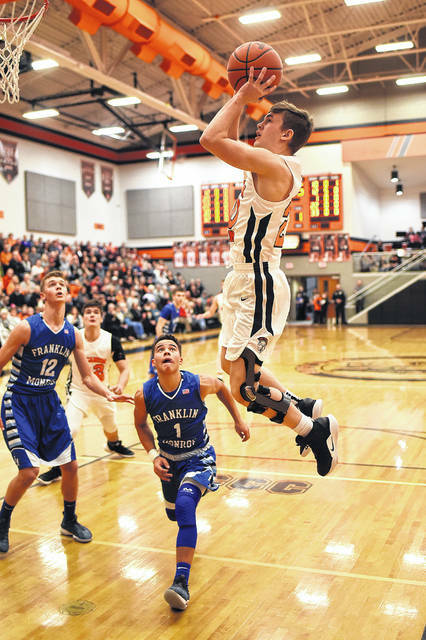 Arcanum’s Lane Byrne takes a short-range jump shot in a Cross County Conference rivalry game against Franklin-Monroe on Friday. The Trojans won the game, 39-37. Franklin-Monroe’s Luke Booher puts up a floater in a Cross County Conference rivalry game against Arcanum on Friday. The Trojans won the game, 39-37. Franklin-Monroe’s Jordan Rhoades fights for a rebound during a Cross County Conference rivalry game against Arcanum on Friday. The Trojans won the game, 39-37. Arcanum’s Carter Gray comes down with a rebound during a Cross County Conference rivalry game against Franklin-Monroe on Friday. The Trojans won the game, 39-37. A pair of Arcanum players celebrate after defeating Cross County Conference rival Franklin-Monroe 39-37 on Friday night. 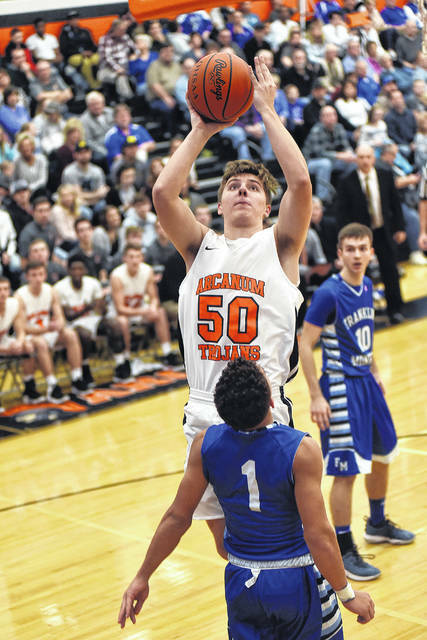 ARCANUM – High school basketball at Arcanum on Friday night is what the game is all about. 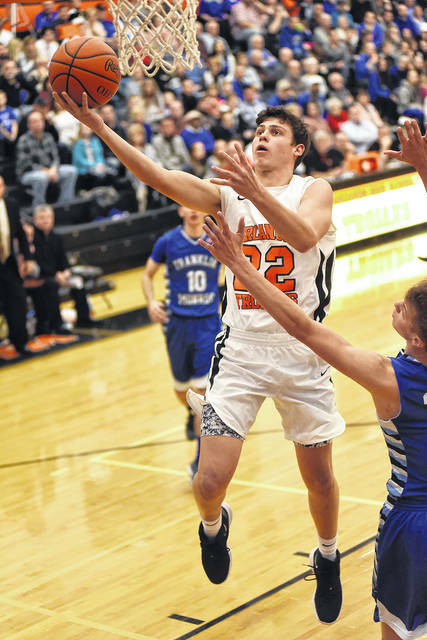 In the end, Arcanum came away victorious 39-37 over rival Franklin-Monroe. Although low scoring, there was plenty of drama, history and great community support for both schools on full display. Before the game, Arcanum honored and presented the 1969 Boys Basketball and Track State Championship Teams that still holds significant pride, not only for Arcanum but all of Darke County, for the accomplishments these fine athletes achieved 50 years ago. After nearly a 5-minute standing ovation for the honorees the energy spilled over into the game as both teams were playing at a high level. Senior guard Wade Meeks scored the first 4 points on drives to the rim for Arcanum only to be answered by 5 points from Franklin-Monroe’s Connor Crist for a 5-4 lead at 5:20 mark. The lead changed four times in the opening quarter with Arcanum taking the lead 11-10 on a drive to the basket by Evan Atchley and then 14-10 to end the quarter on a fielder from Zach Smith. FM charged back to knot the game at 14 on back-to-back buckets by Jackson Crist and Luke Booher. Up to this point in the contest both teams leading scorers – FM’s Ethan Conley averaging nearly 28 ppg and Arcanum’s Carter Gray at 16.5 ppg – were held in check. The remainder of the second quarter saw Gray score 5 points and Conley 4. Conley just missed a half-court shot as the horn sounded to end the first half with Arcanum leading 24-20. Arcanum charged out the gate to start the third period and soon opened up its largest lead in the game 32-20 at the 4:50 mark with freshman Jake Goubeaux and Evan Atchley scoring 4 points. Connor Crist and Ky Cool both hit treys and Jordan Rhoades hit a short baseline jumper to help the Jets stay close trailing 35-28 at the end of the third quarter. 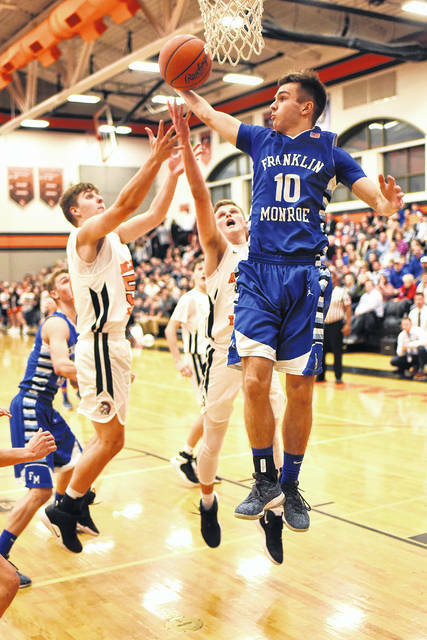 In the final stanza, Franklin-Monroe was forced to change up its defense and apply more pressure along with some run and jump traps to create some opportunities. At the same time, Arcanum went cold and was stuck on 35 for most of the quarter. 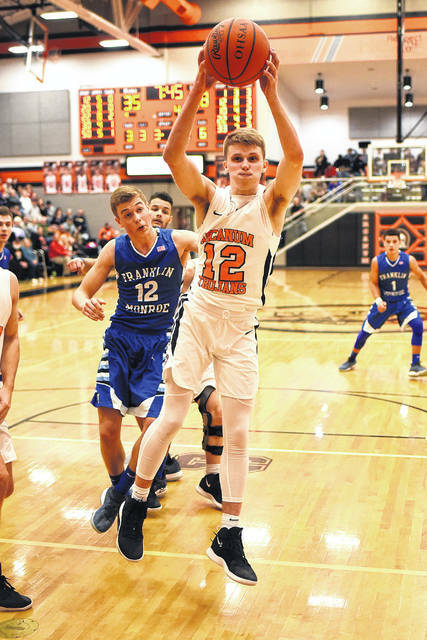 “We got a little stagnant late and was stuck on 35 for a while, we missed some lay-ups, free throws and easy ones, but our defense kept us in it,” Arcanum coach Jim Melton said. Franklin-Monroe took advantage of the Arcanum drought and miscues and got scoring from Conley, Cool and a Jackson Crist lay-up at the 2:22 mark to tie up the game at 35 and the gym was rocking with no one was sitting in the stands. The Jets looking to take the lead got whistled for a charge on a take to basket and Arcanum finally answered the bell after going 7 minutes without scoring to go back in front 37-35 on a drive by Goubeaux at 1:22. Conley tied it again at 37 on a second chance opportunity with 51 seconds to play. Arcanum then successfully held the ball for the next 47 seconds before Meeks was fouled going to the rim and the left-hander was cool as ice nailing the two free throws to put the home team up 39-37 with 4 seconds to play. “He’s our senior and in that situation I’m confident with him at the free throw line and our chances to finally get Franklin-Monroe for the first time in like 6 or 7 years, and he stepped up,” Melton said. The drama wasn’t finished yet as FM would have to go the full length of the court with just 4 seconds and neither team was willing to concede with timeouts to burn to try and get the upper hand. After three timeouts and three defensive changes by Arcanum, FM finally put the ball in play. 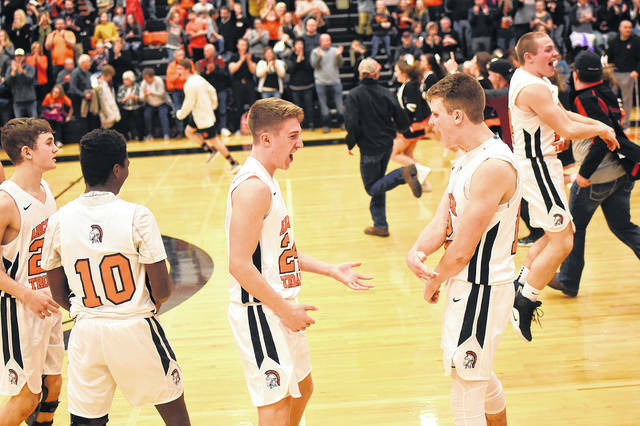 They were only able to get a half-court shot, just like the first half Conley’s heave was just off the mark and Arcanum went into full celebration mode earning the 39-37 Cross County Conference win. “This atmosphere here tonight is high school basketball at its best, both communities are phenomenal with the way they support their schools, and teams. 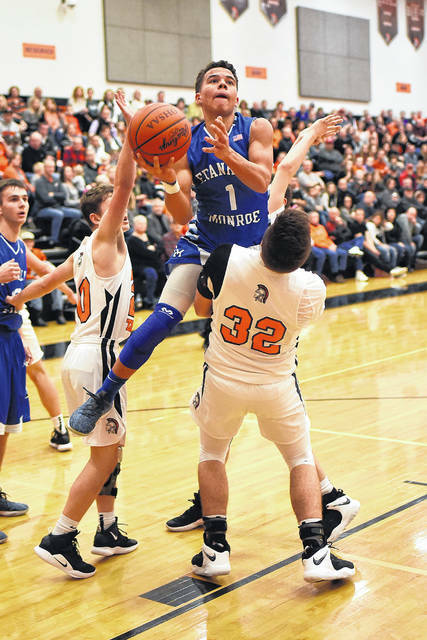 Coach Myers does a great job over there with his kids, they played hard and made a strong run at us, it was a game that easily could have went the other way,” Melton stated. “Carter Gray gets a lot of attention and they (FM) did a good job of taking him away tonight, so I asked him to do some things outside of his comfort zone, play good defense, dive on the floor, get 50/50 balls, get rebounds, and expand your game, and I’m proud of him, he answered the bell, tonight. He wants to play at the next level and he’s working hard on his abilities,” Melton praised. Likewise, Arcanum did a good job of holding Conley to just 12 points. “Evan Atchley played his tail off tonight, it may not show in the stat book, but he did a heck of job on Ethan Conley tonight and credit his teammates who were sitting in the gap and being in the help. We tried to keep them off balance by mixing up our coverages all night and we changed our defenses four or five times, but credit the kids they’ve worked really hard and deserved this win,” Melton concluded. Myers was disappointed with the loss, but was thankful to have this game now to help prepare them down the road. “It was a great environment for us to play in tonight, this was fun to play and is great prep for us in the tournament. It was loud, we’re not at home so it’s just a great experience for our kids to go through, especially some of our youth and some of the guys who haven’t played in something like this before,” Myers commented. “I’m really proud of our kids. We’re down 7 with four minutes to go and found a way to get a couple of stops, but we just had trouble scoring the basketball. It’s evident we don’t want to play a 37-39 game. Give credit to Arcanum they did a good job defensively. What it comes down to is a couple guys making shots, it didn’t happen tonight, that’s the game of basketball. I hate losing and our guys in the locker room hate losing, but if we treat it in the right way it will make us better three weeks from now,” Myers concluded. Arcanum improves to 10-7 overall and 6-4 in the CCC and will play at Bradford on Tuesday. Franklin-Monroe falls to 9-8 overall and 5-4 in the conference and will host league leading Twin Valley south on Tuesday. South is 14-2 overall and 7-1 in the conference. Franklin-Monroe – Cool 4, Rhoades 4, C. Crist 9, Booher 2, Jackson 6, Conley 12. Totals 3-12-4/8 – 37. Arcanum – Gray 5, Meeks 8, Atchley 9, Goubeaux 9, Smith 4, Byrne 5. Totals 2-13-7/15 – 39. 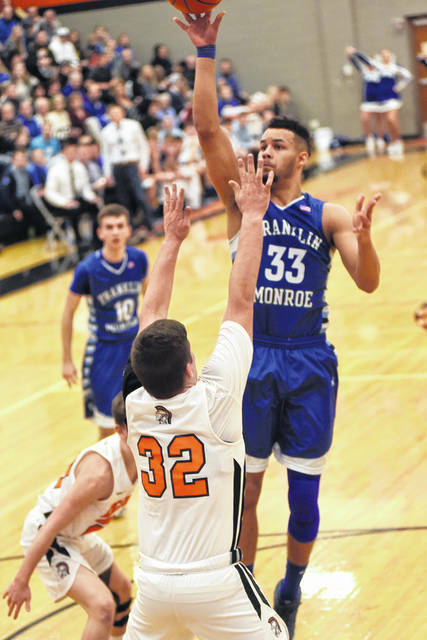 3-pointers – Franklin-Monroe 3 (Cool, C. Crist, Conley), Arcanum 2 (Atchley, Goubeaux).